We invite you to visit to the College of Law and experience the Power of Orange! Schedule your individual visit now. Can't visit in person? Take a virtual tour of Syracuse University's Campus and Step inside Dineen Hall to see a few of the highlights. When driving, Syracuse University is most easily reached from Interstate 81. New York State Thruway travelers should exit at Interstate 81(Thruway Exit 36) and proceed south. Both northbound and southbound travelers on Interstate 81 should exit at Adams Street (Exit 18.) Continue up the Adams Street hill to the third traffic light. Cross University Avenue and continue past Dineen Hall and the Carrier Dome.Turn right onto E. Raynor and right onto Stadium Pl. The entrance for the Irving Parking Garage will be on your right. 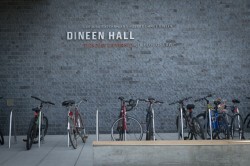 Dineen Hall is located on Irving Ave. and Stadium Place (across from the Carrier Dome).